Concept plan of the Des Voeux Road pedestrian-tram green zone in Hong Kong's Central District. When part of Stockholm’s Drottninggatan was cleared of motorcars as part of an urban renewal project in 2004, there was considerable worry among local businesses over what would become of this historic four-century-old roadway. 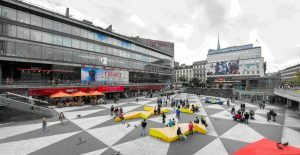 Many believed turning a major section of the Drottninggatan – which translates to Queen Street – into a fully pedestrianised thoroughfare would undermine the mobility and popularity of one of the Swedish capital’s most visited shopping and tourist streets. More than a decade later, the results could not be more different. There are examples aplenty that Hong Kong, self-proclaimed “Asia’s World City” could adopt from Stockholm, the self-proclaimed “Capital of Scandinavia.” Organised by the Civic Exchange, an independent public policy think tank, high-level experts and officials will congregate at the Walk21 Hong Kong Conference later this year to share their views on “pedestrian-first” planning and how it can benefit cities. Contrary to earlier predictions of doom and gloom, Drottninggatan now receives more pedestrians and tourists than ever before. As a core shopping area stretching more than two kilometres from the Old Observatory to the banks of the Lilla Värtan and Riksbron Bridge, a more walkable, pedestrian-friendly and emissions-free Drottninggatan has no doubt played a role in helping to boost tourism and visitor spending. The city’s most visited cultural attraction by visitor number, the Kulturhuset City Theatre, is located along the southern stretches of Drottninggatan. The theatre received an estimated 3.1 million visitors in 2014. Overnight stays by business travellers to Stockholm jumped from two million a year in 2004 to three million a year in just under a decade. The number of overnight stays by leisure visitors has more than doubled in the same period. In some ways, the Drottninggatan has returned to its “people first” roots. The street’s beginnings can be traced 400 years back to the 17th century. Its name is derived from its intention as a tribute to the young Swedish queen, Christina (1632-1654). Around the 19th century, the roadway gradually evolved into an upscale boulevard on which the city’s wealthy elite could stroll and shop. Grand theatres and posh hotels began to spring up around this time. Historic manors and buildings from these bygone eras still line the street, preserving its charm and character. 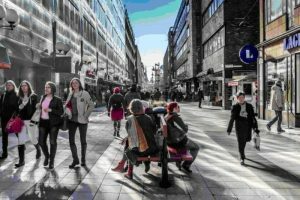 The Swedish capital has been at the forefront of promoting urban walkability and Drottninggatan is just one of several successful pedestrian-minded projects. In fact, the government’s own city plan is dubbed “The Walkable City.” Like many of its European counterparts, that eventually followed suit, the idea of good walkability is to place the average person, rather than the motor vehicle, at the heart of urban planning. Stockholm was one of the international first-movers in the realm of congestion pricing. The City Council first floated a plan in 2003 whose aim was to charge motorway users during hours of peak traffic demand. A six-month trial implementation began in 2006 in the face of divided public opinion – results of a public referendum showed 47.5 percent supported it versus 52.5 against, partly due to the concerns of more costly work commutes. It was approved permanently in 2007. There were substantial and immediate effects. A review by the Centre for Transport Studies five years after the scheme was implemented revealed a 20 percent average yearly reduction in traffic volumes compared to 2005. The number of private cars per person dropped 3.2 percent in 2008, a further 3.7 percent in 2009, 4.1 percent in 2010 and 4.6 percent in 2011. Congestion reduced significantly on approach roads and in the inner city. Roadside air quality improved. Because alternative fuel vehicles bought before 2008 were exempt from charging, their proportion in the vehicle mix went up considerably, from two percent in 2006 to a peak of 14 percent in 2009. In 2008 alone, one third of all cars sold in Stockholm were clean cars. Exemptions were successively phased out beginning in 2009. Despite the fierce opposition in the years up to the trial, a poll in 2011 showed that there was support for the policy from seven out of ten Stockholmers. Hong Kong has recently begun to notice the merits of fewer cars on streets. The SAR government announced late last year that it would be trialing electronic road pricing congestion fees in Central and its surrounding areas. While environmentalists welcomed the levy as a “kill two birds with one stone” approach to tackling congestion and pollution, motoring representatives, business leaders and lawmakers were – quite predictably – against it. Such predicaments may strike a familiar chord with Stockholmers. Trial congestion pricing may be a small step in the right direction but Hong Kong is miles behind in terms of pedestrianisation. Two years ago, some of the city’s sharpest minds on transport and urban planning, the Institute of Planners, City University and MVA Hong Kong and Civic Exchange, put together an ambitious proposal to transform a swathe of Des Voeux Road Central into a tram and pedestrian-only zone in a bid to finally give office workers in the area a breath of fresh air. How can a city develop its own version of a Drottninggatan? Among those attending Walk21 Hong Kong is Erik Pauldin of MTR Nordic, who will share Stockholm’s “Walkable City” story at a session on integrated mobility policy. This is the second of a series of articles by Civic Exchange, an independent think-tank, in its joint programme with Walk21 for the Walk21 Hong Kong Conference scheduled for October 3 to 7, 2016. You may visit www.walk21hk.com for more details and registration. Be the first to comment on "Stockholm sets the standard in ‘people-first’ planning"